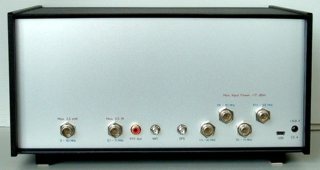 The communications receiver RDR50 is pre-configured for the SW range with optional FM and transceiver operation. Its large display and the modern touchscreen operation allow for easy and quick handling of the device. The device consists of a casing with a one-piece front and rear panel as well as a built-in mainboard. This, depending on version, contains the complete electronic circuit and cant be upgraded later on (with the exception of optional FM as a built-in module). The widescreen display with 7” (178 mm) contains a touch panel for the easy operation of the device. The smooth and non-locking rotary encoder allows for quick adjustments of set values. The casings are powder-coated in matt black, the front panel is available in black or anodized natural aluminum. The rear panel is always aluminum anodized. The devices possess a front-mounted RJ-45 microphone jack and the preparation of the back-mounted plugs (hidden openings) for the later installation of a transceiver or FM module. User interface and device functionality mostly match the ones of the RDR54 and RDR55 devices. Some options aren't available and the RDR50 doesn't quite reach the outstanding specifications of the 54/55. But together with the simpler structure it is considerably cheaper. The RDR50D possesses a fully digital 2x16 bit direct conversion design of the newest FPGA generation with quad FFT speed, WLAN connectivity and GPS stabilizer for ±1 Hz frequency accuracy are built-in. 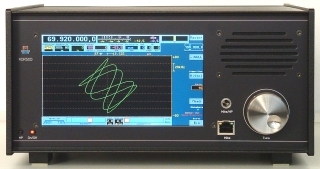 The other specifications of the RDR50 device are the result of the programmed software. Please consult the current documentation (see homepage). User manual for RDR50/54/55 available through the link on the homepage.